The CORAL Steering Committee is turning its attention toward creating a road map for CORAL’s future. While the road map will look at both long-standing technical issues and emerging e-resources trends, the plan will be primarily driven by feedback from CORAL users. The first step in gathering that feedback was a survey conducted for five weeks in December 2017 and January 2018. 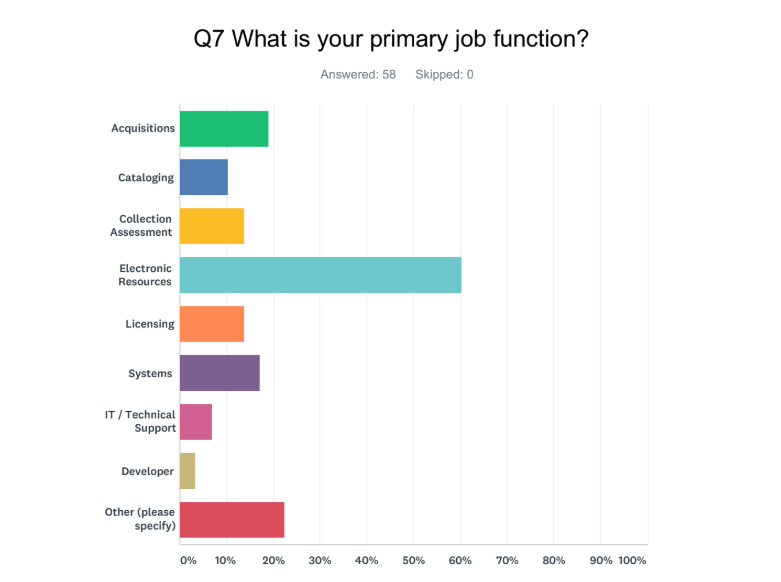 The survey was sent to seven major e-resource-related listservs as well as the CORAL User Group list. The 9-question survey received 58 responses. While 60.34% came from e-resources librarians, many others came from acquisitions, systems, and other areas. Of the 58 responses, 47 were from CORAL users, while 11 responses were from people who don’t use CORAL. 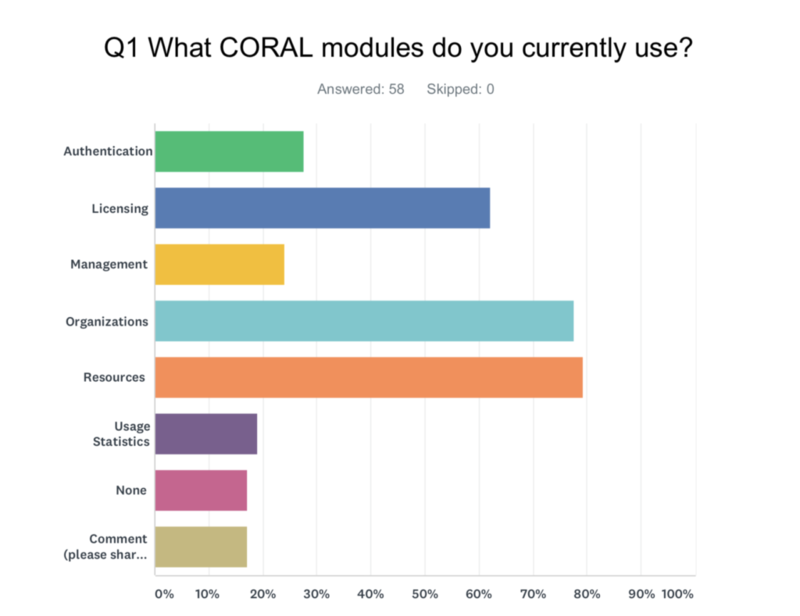 From the survey results, it appears that many users are employing multiple modules within CORAL, but far and away, the most popular modules are Resources (79.31% of respondents use it), Organizations (77.59%), and Licensing (62.07%.) The least used module is Usage Statistics, though many users expressed that they adopt parts of each module. Many respondents asked for features or functionality they’d like to see in CORAL. Easier installation, better support for usage statistics, more precise searches, and integrations with local knowledge bases and systems were popular suggestions. 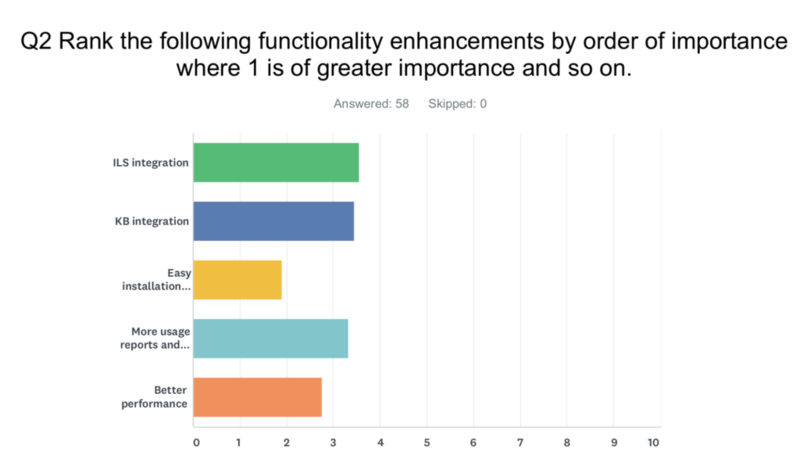 There was a strong interest in improving workflows: users want the ability to flag resources, the ability to add notes and alerts to workflow steps, and to have a calendar in order to see an overview of subscription expiration dates. In the Licenses module, people requested the ability to preview documents and optical character recognition (OCR) functionality for PDFs. There were several import/export recommendations: the ability to import all resource fields, export organization data, and customize export fields. Reports were mentioned several times as a potential way to track cost history and cost per use, as well as a possible custom report integrating resource data with the Expression Comparison tool. Other suggestions included using the API to generate a library’s database or collection page, improving the user interface (including accessibility compliance), having the ability to add notes in any module instead of just Resources, creating consortial functionality to coordinate multiple instances of CORAL, increasing support for privacy and security, and incorporating customer relationship management (CRM) tools in the Issues tab. This feedback from the survey is already proving vital as the Steering Committee begins to establish a road map for the future. The new release in CORAL already features several upgrades relating to ILS integration (thanks to BibLibre’s work with Koha) and knowledge base integration (thanks to SirsiDynix’s work with EBSCO). Also, a group from UCLA, working with the Web Committee, has begun passing around a second user experience survey that will more specifically address the graphical interface and the pathfinding needs mentioned in the first survey. All in all, the feedback already submitted gives both committees a lot to look forward to. "Over the last few years of participating on the CORAL Steering and Web Committees I have seen a lot of growth, you might say maturing, in the project,” Web Committee Chair and Steering Committee member Scott Vieira reflected. “I see the web survey as part of this growth as the Steering Committee wrestles with decisions on how to expand the project in a way that benefits the CORAL community as a whole.” While the surveys are one way to inform those decisions, anyone is always welcome to submit suggestions to feedback@coral-erm.org, especially during these critical planning stages. Between the surveys and other feedback outlets, both committees are excited to see the brilliant ideas and plans for the road map coming from CORAL users.